This FC comes with options, these have to be set first to use the FC. check the attached picture if you need to know where to click. its the cog next to Fight Class field in the general settings. You can choose what blessing to buff, for yourself, and for party members. You can choose what aura you will use. There is an option for lay on hands @ >12% hp. 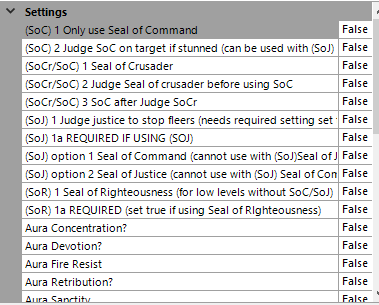 You can choose between Seal of Command or Seal of Justice. Option 1 after judgement of justice is on the target, the bot will use seal of command til its dead..
you cannot use option 1 and 2 at the same time. to turn on options set them to TRUE! I am happy with this FC for what its purpose was, solo grinding. I no longer am playing a paladin so I wont be updating this because I do not have a toon to test with... I can still add features but only on a per donation basis, in which the customized FC will be given directly to you personally and not posted on here. send me a message on this board for more info. Added Seal of Righteousness options for low level players. Righteous Defense will pull targets from any party members when the skill is up and someone besides bot is getting hit in your party. Crusader Aura automagically activates when mounted on Summon Warhorse (change the name of the mount in crusader aura condition to use different mount) will revert to previous aura when dismounted. Judgment of the Crusader with Seal of Command follow up added. Added using SoR after SoCr judgement. redid options to reflect this. Next File Ret Paladin with rescue! Well 5 stars says it all. Extremly good FC. Atleast best i have tried (and i have paid for a few). Great FC, only thing i dont get is why you cant set HoJ and SoC Judgement to use on cooldown.